Plug into the MXR M-116 Fullbore Metal high-gain guitar distortion pedal and experience the full force of what your guitar can do for you! Equipped with all the tools you need for mammoth high-gain riffs and solos, the M-116 Fullbore Metal pedal includes a 3-band EQ with sweepable midrange, a very effective switchable noise gate you can tailor to your taste, and a Scoop switch that boosts lows and highs for big metal tone. All this functionality is packed into a very compact and tough chassis, making the M-116 Fullbore Metal pedal a great fit for your pedalboard. 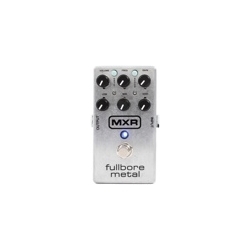 The MXR M-116 Fullbore Metal distortion pedal turns your guitar into a massive-sounding metal tone machine!